The fifth annual Chicago Restaurant Week takes place Feb. 17 through Feb. 26. More than 200 Chicago-area restaurants will participate by offering prix-fixe menus at $22, $33 and $44 (excluding drinks) during lunch and dinner. This year, many restaurants will once again open their doors and will include places like Ai Japanese Restaurant, Manny’s, Bar Toma, Nightwood, Grange Hall Burger Bar, The Bedford, Bistrot Zinc, Mexique, Naha, Blackbird, Blue 13, The Florentine, The Gage and so many more. A full list of participating restaurants is online at eatitupchicago.com, where you can also make reservations. Before Restaurant Week begins, a new party will kick things off. 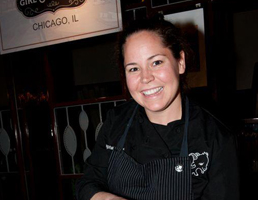 Girl & The Goat chef/owner Stephanie Izard will host the first annual First Bites Bash on Feb. 2 at Union Station (photo above). The evening will feature chefs from dozens of Chicago’s top restaurants, including Spiaggia, Chicago q, LM Restaurant, Table Fifty-Two, C-House, Piccolo Sogno, David Burke’s Primehouse, Saigon Sisters, Henri, The Drawing Room, Epic and more. Tickets are now available online and 100 percent of net proceeds will benefit the Greater Chicago Food Depository. If you are hungry while in the Bridgeport neighborhood, don’t forget to stop by some of the best rated restaurants in the city. Han 202, Nana, Polo Café, Pleasant House Bakery, Bridgeport Coffee House and Zaytune! *To view the article featuring Chicago Restaurant Week, click here!